On July 22, 2014, a Guatemalan Judge ruled that Mynor Padilla – former Army Colonel and former head of security for Hudbay Minerals/CGN – could not get out of jail on bail, as requested by Padilla’s lawyers, pending his criminal trial for the murder of Adolfo Ich, the shooting-paralyzing of German Chub, and the shooting-injuring of seven other people. Rights Action believes this was the proper decision to what had likely been an improper petition on behalf of Padilla to get out of jail. On August 11, 2014, two people showed up uninvited at the tiny home of German Chub, along a muddy track, on the edge of the town of El Estor. They explained that they were there on behalf of Mynor Padilla and could German meet with the lawyers of Padilla to discuss what it would take for German to stop participating in the Guatemalan criminal trial, as a victim-witness, and to stop participating in the precedent setting “Hudbay Minerals/CGN” lawsuits in Canada as a plaintiff-victim? On August 16, 2014, two different people showed up again uninvited at German’s home, to continue with the same message on behalf of Mynor Padilla. On March 28, 2014, a man and woman came to German’s, telling him they were there on behalf of the lawyers for Mynor Padilla, urging German to drop the lawsuits in Guatemala and Canada, stating that Mynor Padilla was willing to offer him Q11,000,000 to do so. On March 29, 2014, other local people phoned German’s brother and told him to bring German to a meeting. That night, they met in a home in El Estor with people who apparently have employment with CGN. They repeated the same offer of money from Mynor Padilla in exchange for abandoning the legal actions in Guatemala and Canada, but were more aggressive in their manner. In April 2014, Rights Action sent a letter to Hudbay Minerals and CGN, denouncing these uninvited, threatening visits, asking them to take all measures to ensure that they had nothing to do, directly or indirectly, with these visits. We heard nothing back. In Guatemala, there is a long-delayed but on-going criminal case against Mynor Padilla, former head of security of Hudbay/CGN (owned by Hudbay 2008-2011), for the murder of Adolfo Ich on September 27, 2009, the shooting-paralyzing of German Chub that same day, and the shooting-wounding of other local men that same day. In Canada, there are three over-lapping, now precedent setting civil lawsuits against Hudbay and CGN (the “Hudbay Lawsuits”) for the killing of Adolfo Ich, the shooting-paralyzing of German Chub, and the 2007 gang-rapes of 11 women from the village of Lote 8. Presently, CGN is embroiled in another very complicated legal investigation related to the suspected murder of three Guatemalan university students, in early 2012, on CGN property, by people allegedly employed by CGN at that time. The students were participating in a formal University del Valle de Guatemala – CGN biology exchange program that had been going on for years, including when Hudbay owned CGN. While this suspected murder of the three students occurred after Hudbay had sold CGN to a Cyprus based company, the Solway Group, many of the CGN people – management and employees – were the same as when Hudbay was the owner and in control. Why Threatening? Who Is Mynor Padilla? German Chub feels threatened by these repetitive, uninvited visits. Long before the violent events of September 27, 2009, Mynor Padilla was well known the region as a former Colonel in the Army and as head of security for Hudbay/CGN. In the context of historical and on-going militarism and repression, racism and impunity in Guatemala, Padilla has been known and feared as a powerful man in the El Estor region. When people arrive uninvited at your home, saying they represent the accused Mynor Padilla, no one in the El Estor region – let alone, an impoverished, physically very vulnerable and indigenous man like German – can ignore the implicit threat. It is possible that Hudbay and/or CGN continue to maintain direct or indirect connections to Mynor Padilla. Padilla remained on the Hudbay/CGN payroll for at least three years after the September 27, 2009, repression and violence, even as he was in flagrant violation of the law, avoiding detention and arrest for the criminal charges. It is rumoured that Padilla has remained on the CGN payroll since September 2012. Moreover, some of Padilla’s lawyers have represented CGN and worked for Hudbay. Carlos Rafael Pellecer Lopez represented both Padilla and CGN in Guatemala, and was a witness of Hudbay and CGN in the civil lawsuits in Canada. This is not the first time inappropriate pressures have been brought to bear on victims-plaintiffs in the Hudbay/CGN Lawsuits. On August 21, 2013, Rights Action sent a letter to Hudbay and CGN, denouncing similar harassing communications and pressures against the women plaintiffs from Lote 8. In November 2013 and March 2014, Klippensteins Barristers and Solicitors sent letters to various offices of the Guatemalan government, addressing these issues related to their clients, the women of Lote 8. There has been no response from Hudbay and CGN to Rights Action’s letter. It is close to 5 years since the shooting of German left him close to death, paralyzed from the chest down. He lost the use of one of his lungs; the bullet remains lodged precariously close to his spinal column. 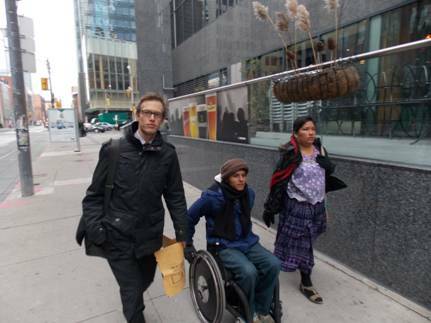 Since September 27, 2009, when he was shot by Mynor Padilla, then head of security for Hudbay/CGN, German has suffered on-going pain, mental and physical therapy and rehabilitation, all the while trying to re-build his impoverished life. German has not received any financial support or compensation, neither from Hudbay, CGN nor the Guatemalan or Canadian governments. I believe that Rights Action, with funds from North American donors, is the only organization to provide German with on-going relief funds to address some of his most pressing short-term health needs. Even as he was receiving the harassing visits on August 11 and 16, German was extremely sick; he remains in unstable conditions and needs more x-rays to determine if the bullet lodged near his spinal column, has moved, and he needs x-rays of his remaining healthy lung to see if there is infection. While there is no doubt in my mind that Hudbay and CGN should be held accountable for the harms and violations they caused (some of which are being dealt with in the criminal and civil lawsuits), and that fair reparations should be paid to German and the others who suffered enormously and continue to do so, I understand that Hudbay and CGN have the right to defend themselves in court. However, Hudbay and CGN have the responsibility to ensure that no one directly or indirectly associated with their companies is, in any way, pressuring or otherwise interfering in any way against any people, plaintiffs or otherwise, involved in the Guatemalan and Canadian lawsuits. Do either of your companies have any knowledge of, or role in the efforts by Mynor Padilla to pressure any of the victims/ witnesses/ plaintiffs to stop their participation in the criminal trial or the civil lawsuits? Is Mynor Padilla still on CGN’s payroll and is CGN and/or Hudbay paying for Padilla’s legal fees in his criminal trial in Guatemala? We hold Hudbay and CGN accountable to take steps necessary to prevent any undue interference, tampering, or direct harassment or repression against German Chub and all victims/ witnesses/ plaintiffs in the civil lawsuits in Canada and the criminal lawsuit in Guatemala. This entry was posted in Conflict and Repression, Corporate Impunity, Oh, Canada: Canadian policy and tagged El Estor, Guatemala, HudBay. Bookmark the permalink.